The board features an unusual set of chips and a USB 2.0 controller from NEC; USB 1.1 ports are lacking at all. We got a pre-production sample with the minimal set of accessories. Intel Active Monitor (for system monitoring). The layout is almost the same as compared with the previous D850MV (on the i850), that is why all drawbacks remain here: audio-ins which are located in front of the PCI slots; the elements are too close to each other because the PCB of almost the same design is used in the microATX version; when a video card in installed it's not easy to handle the memory modules. It's not difficult to reach the only jumper even when the board is already installed. Its function is shown on the textolite. The 3-channel switching voltage regulator incorporates 2 capacitors of 3300 uF and 3 of 2200 uF. The following controllers are integrated: an audio one based on the chipset's capabilities and AC'97 codec AD1885 from Analog Devices with an output for front audio connectors; a network one based on the chipset's capabilities supporting 10BaseT/100BaseTX; USB 2.0 controller based on the NEC D720100AGM chip. Non-unsoldered connectors: 1 PCI slot and 1 CNR, an AUX Power connector and the one with USB ports on the rear panel (it is used in the board version without a USB 2.0 controller). The system monitoring is supported by the SMSC LPC47M142-NC chip. Processor voltage (+3.3, +5 and +12 V), speed of 2 fans and temperatures of the processor (a built-in sensor), and the board (a built-in sensor) can be controlled. There are 2 connectors for adjustable connection of fans and 2 for non-adjustable connection. 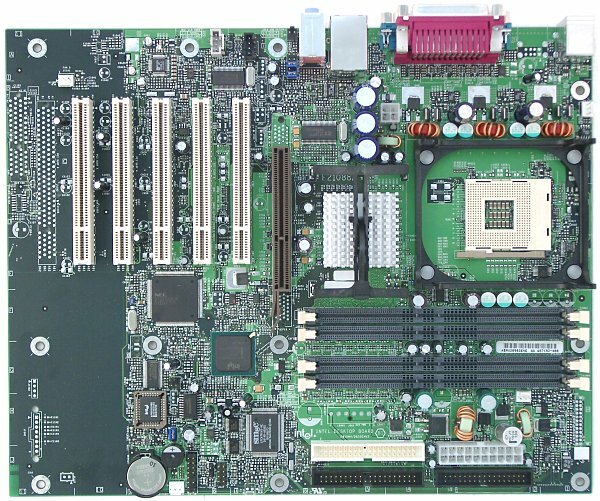 Brief characteristics of the board: memory slots - 4 RDRAM; expansion slots - AGP/ 5 PCI; I/O ports - 2 COM/ LPT/ 2 PS/2/ 4 USB 2.0; dimensions - 305õ245 mm. We used the latest available version of the BIOS - P07. The board is conservative: you can't adjust anything; besides, it doesn't have much functions. I can recommend it for users who don't require much as far as functionality is concerned and who want to get a highly stable solution.